Nobody was injured, including the twirling man. A dust devil blew through a skate park in California on Tuesday. 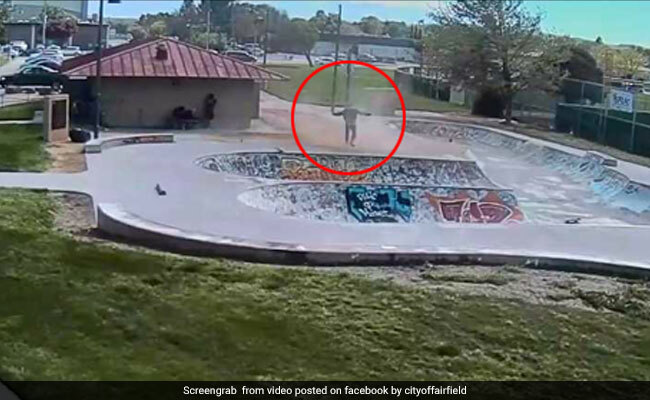 Security cameras at the city of Fairfield, California, captured the moment a powerful dust devil blew through a skate park, ripping apart a roof and 'spinning' a man as it did so. In the footage shared online by the city, the man twirls in one spot as the dust devil swirls debris around him. In the background, the roof of a concession stand is seen getting ripped apart and flying in the air. The incident took place on Tuesday at the Alan Witt Park. Nobody was injured, including the twirling man. Sharing the video on its official Facebook page, the City of Fairfield wrote: "We caught this dust devil in action and the man who "twirled" in it yesterday at Alan Witt Park - Fortunately no one at the park was injured by the dust devil or any flying debris!" The video has collected over 38,000 views since it was shared online. A ton of shocked comments have flooded the comments section of the short 55-second clip. "He's lucky he didn't get hit by the debris. The weird thing about dust devils is the vortex usually comes out of nowhere," wrote one person in the comments section. "I'm so glad I didn't go there yesterday," said another. According to ABC News, crews are now repairing the damage done by the dust devil. According to the American Meteorological Society, dust devils are small but vigorous whirlwinds, usually of short duration. They are sometimes strong enough to cause damage.